You've got to figure there's a screenplay somewhere in the story of Margus Hunt, from his native Estonia to a potential top-10 pick in the NFL draft. The best detail, according to SB Nation, is that the guy taught himself the basics of football by playing Madden NFL—including how many players are on each side. 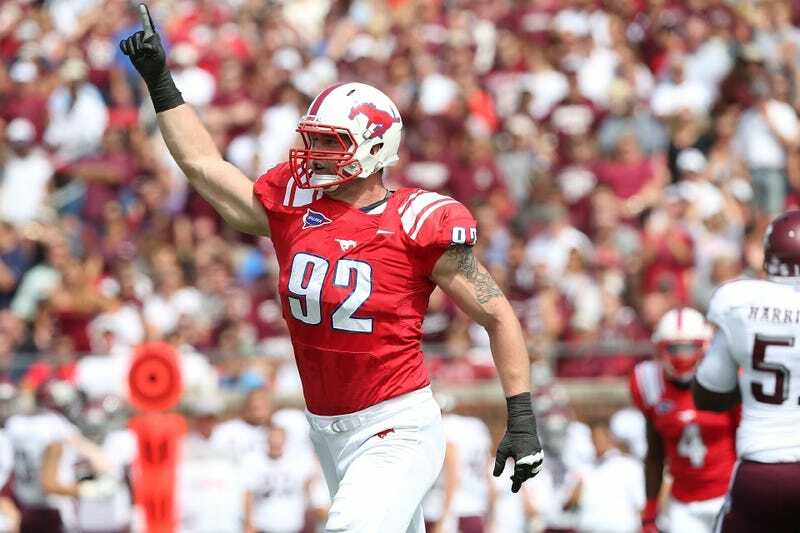 Hunt, a defensive end for Southern Methodist, was also a gold medalist for Estonia's youth track-and-field team. He went to SMU to train with its track coach right as the university dropped the sport. Rather than leave, he got a football tryout and earned a roster spot in 2009. Knowing he had plenty to learn, he flew back home for his Christmas break, bought a copy of Madden, and got down to business. Hunt blocked an insane seven kicks in his first season, one short of the NCAA single-season record. Since then he's emerged as one of the draft's potential steals, projected anywhere from the third round to a top 10 selection. Madden celebrates its 25th anniversary this year, so its role as a tutorial for a generation of football players is well known. Raheem Morris, formerly the coach of the Tampa Bay Buccaneers, famously said he "majored in Madden," when he played at Hofstra, crediting it with building up his coaching acumen and inspiring him to pursue the career. Madden's influences have been seen elsewhere, most famously in 2009, when Brandon Stokley of the Denver Broncos caught a deflected pass for a game-winning touchdown, running parallel to the goal line to bleed out the clock before scoring. The tactic has been a common feature of video game football going back to Tecmo Bowl.